The construction is simple and very forgiving. This a great beginner sewing project! Sewing machine - I used this project to test out a serger a friend gave me but you don't have to. If you don't want to go to that expense, you can buy a serger sewing machine foot here that turns your sewing machine into a serger! 1. Cut one large rectangle of fabric and two lengths of ribbon/cord/trim for the tie. 2. Fold the fabric rectangle in half right sides (the pretty part) together and pin the fabric into place. 3. 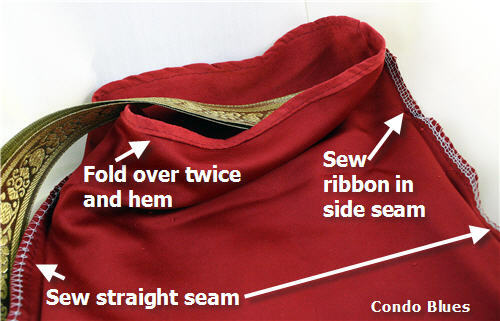 Pin the two lengths of ribbon in the side seam a few inches from the top of the bag. The long tails of the ribbon will be on the inside of the fabric bag during this step. When we turn the bag right side out at the end the ribbon ties will be on the outside of the bag. Clever huh? 4. Use the sewing machine (or serger if you want to get fancy) to sew the two outside ed the bag together. 5. Use the sewing gage to turn the top raw edge of the bag over twice (I used a 1/4 inch seam. You can use whatever measurement you like) and pin the fold into place with the straight pins. Since I am working with such a small seam, I ironed the fold into place to make sewing it easier. If you don't want to break out the iron, you don't have to. Tip: I used the selvage edge (woven side edges of the fabric) for the top of my bags when I could depending on the print, so I didn’t have to hem them. Sneaky! 6. 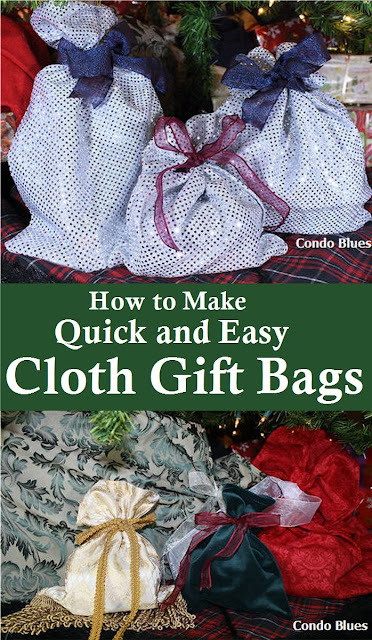 Turn the cloth bag right side out, fill it with a thoughtful gift, and use the ribbon to tie it closed. I used the paper gift bags in my gift wrapping stash to help me decide what size bags I should make. In same cases, I let the size of my fabric scraps determine the size of my cloth gift bags. I tried to err on bigger sizes because you can always put something smaller in a bigger bag but not the other way around. I got on a roll and upcycled a few things too. I made the gold bags from a shower curtain I bought for the Master Bathroom but didn’t quite work as well as I hoped in the bathroom. It looks much better under my Christmas tree. I like the fringe on the gold bags the best. I made this silver dress for the finale of vaudeville show and shoved it in the back of the costume closet soon after. I got another use out of it when Blitzkrieg, Husband, and I competed in the 24 Hour Film Contest. This is Blitzkrieg’s big high five scene. He nailed it on every.single.take. The lining shrunk when I washed the dress (which made it an interesting repair project for the next concert I had to wear it, let me tell you) and I was happy when I had to retire it. The dress makes prettier gift bags than it did a dress. How perfect would this glittery bag be for The Festival of Lights?! Made from sparkly recycled materials - for reals. I wonder how much Hanukkah gelt they hold? This brings me to my December One Small Green Change. 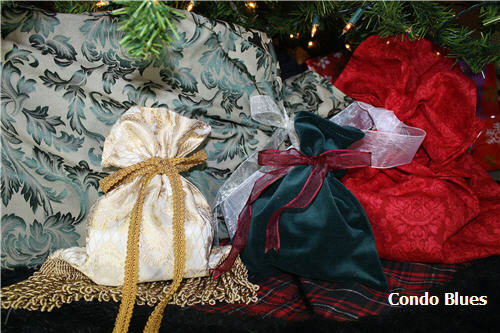 To wrap most of our Christmas gifts in reusable cloth gift bags. It isn’t practical to use the gift bags for all the gifts we are giving this year because we have to ship to our family out of town. I’m still going to use wrapping paper for those gifts because I won’t get the cloth bags back to use next year. I love my glammy gift bags and how much time they saved me wrapping gifts this year! However, this may not work for you if you have a pre-holiday gift peeker at home. Fortunately we don’t. 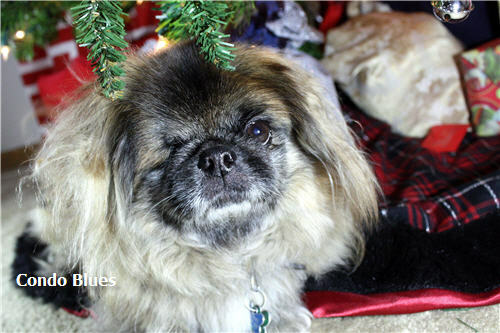 However, I do have a little Peke photo bomber who ran to the tree once I pulled out the camera to take pictures for this post. In other words, just a typical day here at Condo Blues. If you'd rather buy than DIY, check out the options - and more! - below! 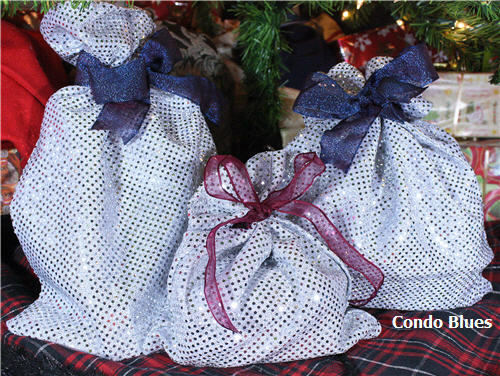 These bags are adorable and I love the idea that they are reusable unlike wrapping paper! I made reusable bags for Christmas this year too! I ran out of fabric, but I am hoping to score more after the holidays. Very cute! If you get a chance, I'd love to have you link up! http://scrapbookingez.blogspot.com/2011/12/anything-goes-linky-party_15.html. Thanks for sharing! Your gift bags are really cute! I've been trying to get this same project done for a couple of years now but I don't think this is going to be the year either. maybe this summer? Mary - Summer is the perfect time to do this project for the following Christmas. I sewed mine last year at the end of January - beginning of February. That's the time of year Cabin Fever takes hold and I need a project to keep me from packing my bags and hitch hiking to the Carribean. Really, you cut up your dress? Actually, I reuse the fabric from clothing, too. It's a great reuse I think. Not only green, but sanity saving as well! Especially next year when you will have already done all that sewing previously. I made a few bags from pant legs this year, but won't get them back after they are given. Hopefully the recipients will reuse them. yay! I remember you tweeting you made these, but that you wouldn't post until holiday season - so pretty and useful. All my nieces and nephews got gifts packed in new useable totes picked up at library conferences and that way they could put their haul in them and help their parents get packed up. The lining of the dress shrank when I hand washed it after the show. I had to do some creative tailoring on it so it fit correctly for the following year's show. The color washes me out so it wasn't my favorite either. I like it as a gift bag much better!